Thai Chef's Thai tea custard ($7.95) is a thicker, richer version of the popular Southeast Asian drink made with black tea and condensed milk, and served with toast. Thai Chef in Dupont Circle offers a taste of authentic Bangkok-style street food and stylish desserts coupled with irresistible happy hours. At its location on 1712 Connecticut Ave. NW, Thai Chef accommodates guests with ground, bar and mezzanine level seating. The restaurant’s interior stands out with bright teal walls, punchy orange accents and an impossible-to-miss marquee sign out front, creating a fun and modern atmosphere. The restaurant serves lunch and dinner seven days a week. In addition to regular menu offerings, there are also specials for lunch and happy hour. From noon to 3 p.m. daily, Thai Chef offers lunch specials that include an appetizer, entree and drink, including classic pad thai starting at $12.95 for all three items. Later, from 4 to 7 p.m. daily, the fixed $5 happy hour menu consists of various cocktails, beers, wines and street food bites like savory Thai-style chicken wings and crispy spring rolls. To start your meal, the restaurant offers a variety of cocktails. You can spice up your dinner with Tracy on Fire ($10), a mango rum cocktail infused with Thai chili. If you’re feeling more traditional, stick with a margarita or cosmopolitan, which both go for $8. 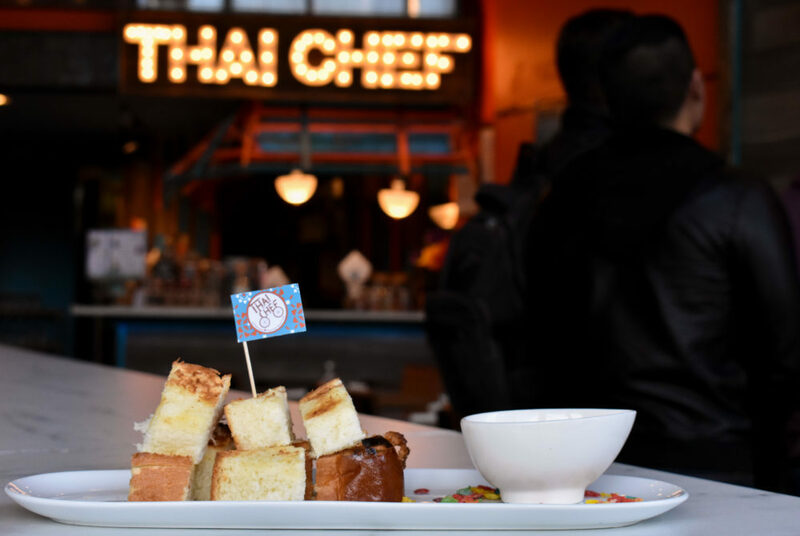 For nonalcoholic beverages, bubble milk tea is the main draw, made with Thai tea or coffee ($4.95), but the stand-out menu item is an uncommon approach to the staple beverage: Thai tea custard with toast ($7.95). The Thai tea custard is a thicker, richer version of the popular Southeast Asian drink made with black tea and condensed milk. Instead of being served in a glass with tapioca pearls, this version is served as a dessert at the restaurant’s dessert bar, which opened in February. The dessert is served in a small bowl and comes with several cubes of brioche toast for dunking into the sweet sauce. The pieces of brioche come buttered and toasted, serving as a vehicle to eat the sweet and creamy custard. The dish doesn’t skimp on presentation. Toast cubes are stacked high on the plate and a small Thai Chef flag sits planted on top, while colorful pieces of Fruity Pebbles cereal garnish the plate. Each cube of the toast is slightly crispy, allowing the custard to be absorbed without making it too soggy. The rich and sugary custard paired with the hints of butter on the thick toast make for an interesting pairing, but the two opposing tastes of sweet and salty complement each other well. Next time you want to reach for a tall glass of bubble milk tea, swap it out for an extra-sweet dessert version from Thai Chef.